They are dusting off their cutlasses, refreshing their command of "The Code" and getting ready to celebrate an event that marks the beginning of the "High Story Season" for one of Second Life's oldest spoken word programs - now in its tenth year. 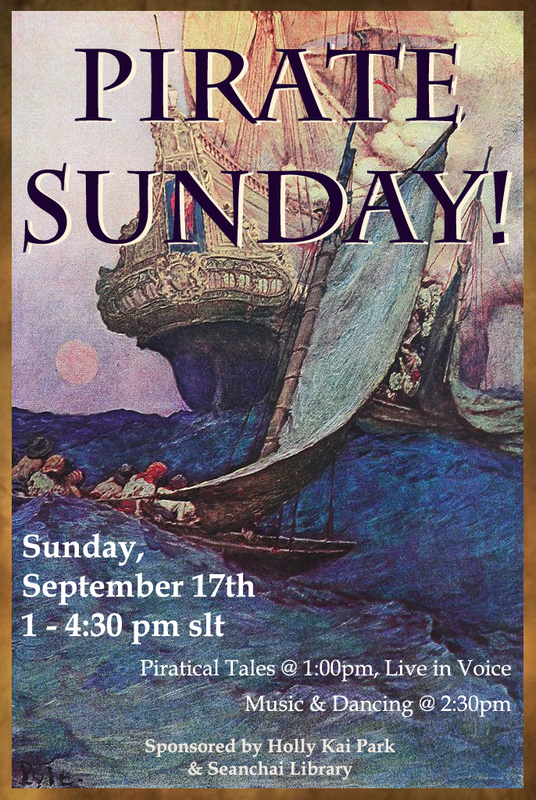 Seanchai Library will celebrate International Talk Like a Pirate Day with Pirate Sunday on September 17th beginning at 1pm at Holly Kai Park, followed by music and dancing across the region at the Holly Kai Park Pavilion. "Anytime of year is a good time for a story," said Chief Storyteller, Shandon Loring, " but Talk Like a Pirate Day really kicks things off. It will be one special theme after another, with a lot of extra demand for stories, from now until a few weeks after St Patrick's Day." Seanchai Library is launching the season in style this week: presenting a schedule littered with swashbuckling tales, and offering its second annual Pirate Sunday featuring 90 minutes of salty adventures live in voice with Kayden Oconnell, Aoife Lorefield, and Caledonia Skytower. At 2:30pm festivities will shift over to the Holly Kai Park Pavilion (just a teleport away by the on-island system) for music and dancing. The Pavilion is easily accessible to vessels enjoying the Blake Sea, and residents are invited to sail by and drop in to shake their swashbuckling money maker. Pirate Sunday benefits Feed a Smile, supporting a school in Kenya founded and run by Brique Live and Learn in Kenya charity. 100 Lindens equals approximately 30 cents in real world currency, which pays for one child’s meal. One third of all money raised for each month's food budget is collected through donations in SL at The Lavender Fields where musicians perform in support of the children. Seanchai Library will follow up Sunday's festivities on Tuesday, September 19th (the day itself!) 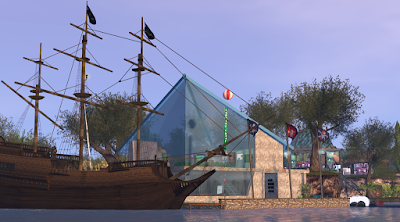 with two back to back story sessions featuring the piratical works of writers active in Second Life. At 7pm "Pirate George Night" will feature selections from R. Crap Mariner's canon of 100 word stories - known as "drabble." Just over a year ago Mariner began writing pieces which began with the line "George was a pirate, but he wasn't a very good pirate..." and the rest is history. Members of the Seanchai staff will bravely share George's various pirate adventures, selected randomly from the "George stories," and read "cold" - with no advanced preparation. At 8:30pm, author Matthew Howard will share an episode from his own canon of works featuring an interstellar female pirate in 2029 - Meteor Mags. In "Hang My Body on the Pier", the heroine recalls the exploits of her great grandmother, who rose from a disguised ship's boy to a Pirate Queen, connected to the legends by a song. Author Howard will present the story himself, live in voice. International Talk Like a Pirate Day is a parodic holiday created in 1995 by John Bauer ("Ol' Chumbucket") and Mark Summers ("Cap'n Slappy"), of Albany, Oregon, U.S., who proclaimed September 19 each year as the day when everyone in the world should talk like a pirate. The holiday, and its observance, springs from a romanticized, and comic view of the Golden Age of Piracy. According to Summers, the day is the only known holiday to come into being as a result of a sports injury. During a racquetball game between Summers and Bauer, one of them reacted to the pain with an outburst of "Aaarrr! ", and the idea was born. The event will begin at the Seanchai Library at Holly Kai Park. All listed times are slt. "any ink is good ink, even if it is virtual"